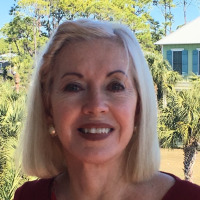 Linda Heavner Gerald received the prestigious FAPA Award for fiction in 2017 and 2018. She is deeply humbled and grateful for the award that she holds in the photo above! Writing is my passion! It is a gift from God. Award-winning author, Linda Heavner Gerald, was voted One of Fifty Great Writers You Should Be Reading by the public. She was also voted a finalist in Novelunity which features authors from all over the world. If you love Mystery/Thrillers with a twist, her books will draw you into their story. Linda is retired with her husband. They live on the Gulf of Mexico. Currently, she has thirteen published novels with another Thriller to be released soon. Her goal in writing is to demonstrate that regardless of our actions, God is always ready to welcome us back with forgiveness. Although her books begin with the mess of a life, which the protagonist may have created, they soon demonstrate hope does exist for all. The books are of substance with something to challenge or encourage. A medical background allows her to incorporate current facts, which she hopes may cause a reader to seek professional advice for problems that may not have seemed important.